Commentaries on the Bible were a necessary component of the medieval libraries of large monasteries and cathedrals. Excerpts from them were read aloud during some of the services and during mealtime. Theologians needed them for their studies, and monks read them as part of their contemplation of scripture. 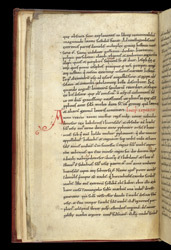 This copy of St Jerome's 'Commentary on the Prophet Daniel' is thought to have belonged to the Benedictine Abbey of Saints Peter, Paul and Andrew, at Peterborough. Medieval books provided readers with signposts to tell them where they were in a book, much as titles and section headings work for readers today. In the middle ages, these 'signposts' were often written in red. On this page the red writing says that the 'exposition begins': the prologue has ended and the commentary proper starts--with the large, red letter A. Errors in books were a fact of life for medieval readers. On this page, some errors have been corrected by notes between the lines. One of them corrects the spelling of "Nebuchadnezzar" (Daniel 1:1).